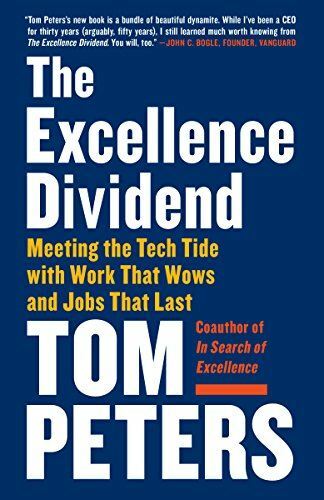 I am currently reading Tom Peters’ new book The Excellence Dividend: Meeting the Tech Tide with Work that Wows and Jobs that Last. 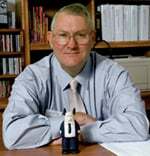 I have been reading Peters since his original 1982 bestseller that he co-wrote with Robert Waterman, In Search of Excellence. In many ways, Peters’ search for “excellence” mirrored the national movement in search of better quality…and it influenced my leadership philosophy (and my teaching philosophy) for the past quarter-century. Peters noted that this current book is a sequel of sorts to his 1982 book…and while I agree, it also resurfaces many suggestions from his 2003 book Re-Imagine! : Business Excellence in a Disruptive Age, which remains one of my favorite leadership books. The book was written with CEO’s and management in mind, but I read it with faculty development in mind…and I think there are some interesting lessons to gain from this book. This will be the first of several posts based on Peters’ book and my own thoughts about the role of Centers for Teaching (CFT’s), tying in some of the other recent books I have read. I was extremely lucky to work in the VCU Center for Teaching Excellence for 8 years with a band of brothers and sisters that took the word “excellence” seriously. Unfortunately, changes in upper leadership led to this Center being “disrupted” and basically eliminated…I think to the detriment of faculty. So I am obviously biased and that will factor into these posts. Peters starts his book by noting that In Search of Excellence was written in dark times for American businesses…and that today we face equally troubled times, thanks to the acceleration of technology. As such, his book calls out a similar theme to Tom Friedman’s Thank You for Being Late: An Optimist’s Guide to Thriving in the Age of Accelerations, which I blogged about here. The term “optimist” is interesting, as Peters noted that he too is an optimist. He believes strongly that human attributes – effectively employed – remain beyond the realm of artificial intelligence (AI). In this, he echoes themes Joseph Aoun raised in Robot-Proof: Higher Education in the Age of Artificial Intelligence. Peters noted that excellence translates into an emotional bond with customers and communities which cannot be replaced by an algorithm. CFT’s that work also establish emotional bonds with faculty and tech staff. One of Peters most powerful statements…and one I totally buy…is that excellence is not a metric – it is a state of mind. Peters first section is on Execution. He draws from his early days in the Navy Seabees and lessons of “Can Do!”. Peters is not big on planning…rather he suggested that we learn from Ulysses S. Grant, whose mantra was do it until it is done, don’t overcomplicate it, and move on to the next thing. He described Grant as a man of action in a sea of procrastinators. Peters also tied successful execution to collaboration. He noted that “we” beats “I”…which suggested interdisciplinary approaches. Again, CFT’s tend to be hubs of interdisciplinary approaches at universities. When I was at the CTE at VCU, we were known for being proactive…and for partnering across the university. This for me ties directly into the role of consultants in CFT’s – to facilitate faculty teaching and research such that the faculty become more than they’ve dreamed of being. Peters stated that “excellence” and “business” should be used in the same sentence…and the same could be said for “excellence” and “teaching.” Peters said that every management job is an opportunity to change the life trajectory of every employee in their charge and provide services of the highest value imaginable to their customers and community…words that could easily be applied to CFT’s consultants as well. They could (and should) be tied to the role of faculty – an opportunity to change the life trajectory of every student and provide services of the highest value imaginable to their students and discipline. Again…it is a state of mind…and mindfulness is something many CFT’s have been exploring. Peters sees the role of every business employee – nurtured by management – to be emotional, vital, innovative, joyful, creative, entrepreneural, and excellent. I can see these same terms being applied to the roles of teaching consultants in CFT’s…and as a byproduct, to every student. It is these “hard” attributes that provide opportunities for CFT’s! To be great instead of big, Peters suggested cultivating close relationships with customers and suppliers, developing intimate relationships with their community, working for a harmonious working environment within the organization, and cultivating passion for what they do. In many ways, these align with Edwards Deming’s Principles for Quality that I used in my dissertation. 2. Adopt a new philosophy. 4. End the practice of awarding business on the price tag alone. 10. Eliminate slogans, exhortations and targets for the work force. 3. Evaluation by performance, merit rating or annual review of performance. 7. Excessive costs of warranty, fueled by lawyers who work on the basis of contingency fees. These were developed in the 1970s and 1980s…but they still provide a foundation for CFT’s to use today. I’ll continue to provide lessons I spotted for CFT’s from Peters’ book in my next posts.